Growers of tree crops apply a range of different nutrient management strategies. One of the simplest forms of nutrient management bases fertilization decisions on the ‘Critical Value’ (CV) concept, where fertilizers are applied to ensure that leaf nutrient concentrations exceed what has been determined as the critical concentration for good yield levels. In this approach, leaf nutrient analysis only provides an indication of adequacy or deficiency, rather than specific information on appropriate fertilizer rates or timing of applications. These models, available in Excel format, were developed from 4 years of research in Nonpareil almond orchards. Download the Models for more information, including leaf sampling (collect in mid-April) and N values (predicted for July). Almond harvest in experimental orchard. Kern Co. 2011. Nutrient management recommendations in most nut trees have been based on the Critical Value concept. Ideally, critical values are established by controlled experiments in which the relationship between yield and nutrient concentration is closely followed. The majority of critical values relating to almond, however, have been determined on the basis of visual symptoms. Sound nutrient management will require 1) knowledge of the scale and timing of nutrient demand by the crop, 2) an understanding of the relationship between fertilization type and rate and crop response, and 3) optimization of nutrient delivery mechanisms. This project aims to advance our approach to nutrient management with a primary focus on nitrogen and potassium and secondary focus on P, S, Mg, Ca, Zn, B. Moreover, it will strive to critically examine the standard sampling practices used in orchard management for assessing plant nutrient status. Improve the practice, use and utility of leaf sampling and interpretation by: a. 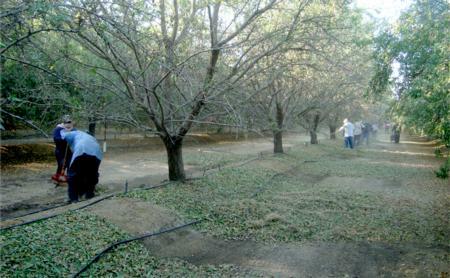 Determining the degree to which leaf nutrient status varies across a range of representative orchards and environments. b. Determining the degree to which nutrient status varies within the canopy and within the year. c. Validating current CV’s, establish more robust and useful leaf sampling protocols and determine if nutrient ratio analysis provides useful information to optimize fertility management. Develop a ‘nutrient budget’ approach to complement leaf sampling and interpretation. a. Develop a phenology and yield based nutrient model for almond and pistachio. Develop and extend an integrated nutrient Best Management Practice for almond and pistachio. Develop fertilizer response curves for fertigation systems. The evaluation of nutrient use efficiency of various N and K rates and sources is also an aspect of the research.